Jeremy Frey web basket with points. This innovative design is everything you would expect from Frey. 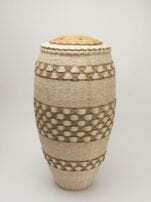 The inner woven ash basket is surrounded by a web of thicker pointed ash. Beautifully woven black and white shapes on finial. 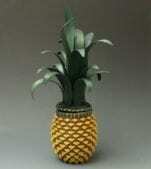 Size: 9" diameter; 13" high, including finial. Materials: brown ash, sweetgrass, dyes. Jeremy Frey urchin basket with points. 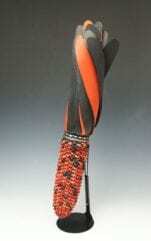 The orange areas contrast beautifully with the black as well as the naturally colored areas. 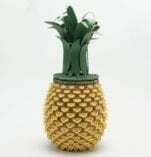 Size: 8" diameter; 4 1/2" high, including finial. 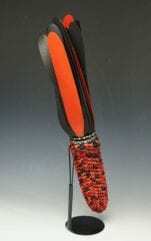 Materials: brown ash, sweetgrass, dyes. 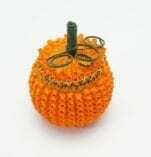 A delightful miniature pumpkin basket by Ganessa Frey, wife of award-winning basket maker Jeremy Frey. 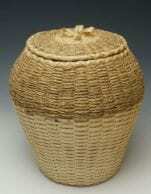 This basket is tightly woven from brown ash with sweetgrass around the rim. 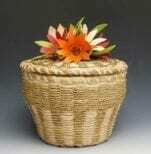 It is a miniature basket with great presence. 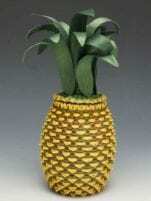 Basket is 2" diameter at its widest; 2" high; 3" high including stem. 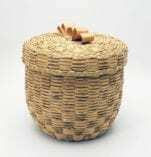 This basket by Theresa Secord, founding director of the Maine Indian Basketmakers Alliance, is woven from cedar, brown ash, and sweetgrass. 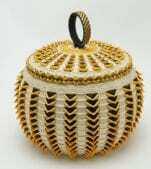 It is based on baskets made generations ago by Secord's family and other Wabanaki weavers. Cedar is viewed as a potential replacement for ash, which is threatened by the emerald ash borer beetle. Maine basketmakers are looking to a future where their sacred wood may be lost for a generation or two. 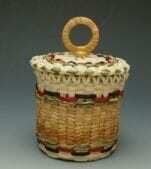 Basket is 2 1/4" high; 3 1/2" high including the finial. It is 2 1/2" at its widest point. 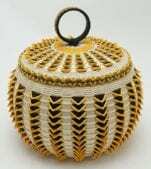 This basket by Theresa Secord, founding director of the Maine Indian Basketmakers Alliance, is woven from cedar, brown ash, and sweetgrass. 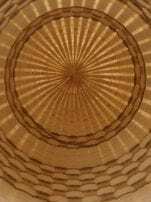 It is based on baskets made generations ago by Secord's family and other Wabanaki weavers. Cedar is viewed as a potential replacement for ash, which is threatened by the emerald ash borer beetle. Maine basketmakers are looking to a future where their sacred wood may be lost for a generation or two. Basket is 4 1/4" high' 5 3/4 high including the finial. It is 4 1/4" at its widest point. 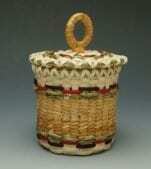 Frances (Gal) Frey, mother of Jeremy Frey, is a master Passamaquoddy basket maker in her own right. 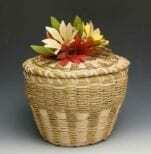 This round ash basket is adorned with a rich, warm russet color as well as braided sweetgrass. 5 3/4" diameter x 4" high, including finial. Jeremy Frey cage basket This innovative design is everything you would expect from Frey. 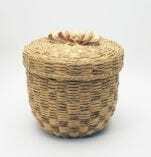 The inner woven ash basket is surrounded by a cage of thicker pointed ash. Beautifully weave on the finial. Size: 6 1/2 in. diameter at its widest tapers to 4 in. at the base; 12 1/2 in. high, including finial. Materials: brown ash, sweetgrass, dyes. Ganessa Frey strawberry basket. 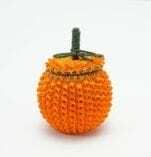 A colorful miniature strawberry basket by Ganessa Frey, wife of award-winning basket maker Jeremy Frey. 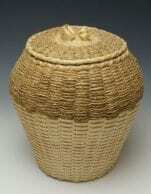 This basket is tightly woven from brown ash with sweetgrass around the rim. 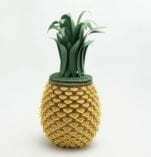 It is a miniature basket with great presence. The natural position of the basket is on it side, as real strawberries lay. 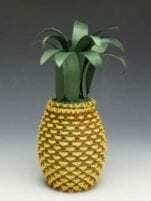 Basket is 1 3/4" diameter, tapering to 1" at base; 2 1/2" high, including stem.